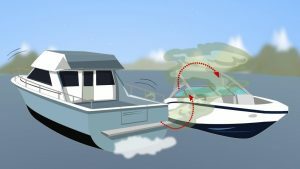 Always be aware of your surroundings when boating. Last week, we talked about the dangers and symptoms of Carbon Monoxide Poisoning when boating. Since then we’ve gotten some questions about the areas boaters should avoid when out on the water to help deter it. Do not swim near or under the back deck or swim platform. Carbon monoxide from exhaust pipes of inboard engines, outboard engines, and generators can build up inside and outside the boat in areas near exhaust vents. Avoid “teak surfing” (also known as platform dragging), sitting on the swim platform or swimming directly behind the boat when the engines are operating can be deadly within minutes. Follow this checklist to help avoid carbon monoxide poisoning. Never enter an enclosed or partially enclosed area under a swim deck or platform where the exhaust is vented, not even for a second, even if the engines/generators are off and have been off for a long time. Exhaust lingers in such areas, and it only takes one or two breaths of contaminated air in this “death chamber” to kill a swimmer. STAY AWAY from open exhaust vent areas. Do NOT swim, sit, or stand in these areas when the motor or generator is operating. On calm days, wait at least 15 minutes after the motor or generator has been shut off before occupying open areas near exhaust vents. In Utah, operating a motorboat or having the engine of a motorboat idling while a person is occupying or holding onto the swim platform, swim deck, swim step, or swim ladder is prohibited due to the risk of carbon monoxide poisoning. This restriction does not apply when the person is assisting with the docking or departure of the motorboat or while the person is exiting or entering the motorboat.